I recently picked up a book Never Unprepared: The Complete Gamemaster’s Guide to Session Prep. An interesting read, and one which I’m sure will bring some changes to my game prep activities. The link to this column, however, is that there was a chapter devoted to prep tools, which discussed the use of Microsoft OneNote as one possibility for this. If you’re anything like me with your role-playing campaign, organisation of your campaign and game notes becomes a bit of an obsession!? Your adventures, NPCs, locations, maps etc or have to be catalogued in a manner that makes sense (to you, if no-one else…), and hopefully, makes your actual game at the table easier. Sound familiar? In the old days of my Tolrendor campaign, well before there were even widely available word-processors for home computers, let alone ones that offered a WYSIWYG option, ring-binders and dividers was the only way. I’ve posted before about my complicated mapping system, and written notes were no exception. Nowadays however, the computer comes to the rescue, especially in the sense of being able to hold (and carry about) a huge amount of information. But is it any better organised? I started using Microsoft OneNote a couple of years ago, when I first got back into gaming with my kids. This application has been part of the Office suite since 2003 (I believe), but it seems to be very much the forgotten cousin. I’m surprised at this, as its actually a really useful tool. Section Groups and then Sections, which contain the actual pages (and in fact you can also have sub-pages). This allows me to create and organise all my campaign notes in one place. In the screenshot, you see my main Tolrendor Notebook, with top level ‘Campaigns’ and ‘Gazetteer’ section groups, and so on … down to the pages and sub-pages that comprise the actual entry for the Town of Fallcrest Overview. You can also see a number of sections pertaining to Fallcrest, including Detailed Locations, Non-Player Characters and Groups and Factions. Each of these sections has its own page structure. You can also create hyperlinks between different pages, and also search pretty efficiently. One neat trick is that you can embed PDF files as a series images (per page), and the text in the PDFs is then searchable. Tools for highlighting and annotating your information are also available. One thing I definitely like is that there is no massive complex library format; rather the whole notebook is contained in a folder-based structure. Each section group is a sub-folder, and each section is a OneNote .one file. This has several benefits. First, there is not one massive file that you’re completely dependent on, and if it gets corrupted, then bye-bye notes! Second, I find it convenient to store any other files that relate to your data in the same folder structure, rather than separate locations. And thirdly, it makes it very simple to sync your whole set of notes via Dropbox (or some other cloud service) without any specific functionality in the app itself. I can quite happily work on my campaign on my laptop while I’m travelling, and have it automatically appear on my home computer on my return. Sadly, no application is perfect! 🙂 A few things about OnNote frustrate me, although not enough to stop using it! As it is designed for note-taking, there is only limited control on the layout of individual pages. That’s great for quick editing, but a pain if you want to print your notes out in a presentable manner. It would also be great if there was more native support for PDF documents e.g, if you have a PDF embedded in a page, it would be useful if it could support paging through the document in-situ, rather than having to either embed it as images (which looks ok but I’ve noticed does hugely inflate the .one file size) or an icon, which means it launches in a separate app. Another limitation is its handling of embedded files – to show these on a page, the app actually embeds them in the .one file. From there, you can open and edit them, but the actual file is hidden from you. I really don’t like that – call me paranoid, but I like the ability to physically see my files on disk, to rename/version them etc! Given that other Office programs support linking to files, and in-place editing, I’m a bit surprised at this lack. In summary, I like Microsoft OneNote, and prefer its free-form functionality to any of the RPG-specific applications I have tried. But it’s certainly not the perfect solution. Well, the one aspect that frustrates me the most is the inability to create something once, but use it in multiple places. 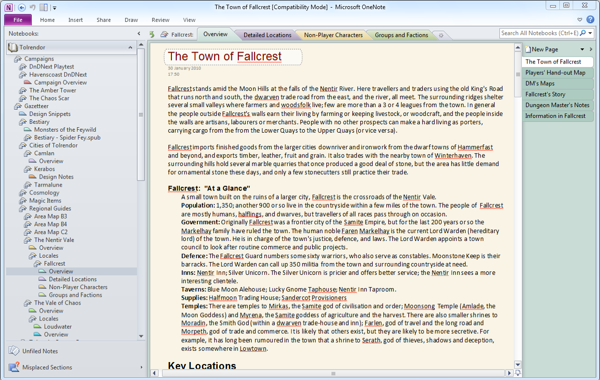 For example, I may have written a great city introduction in one section of my notes, but when I create a PDF layout of a regional guide, or need a side-bar of information in my game session notes, I want to be able to use the same piece of text without copy and paste, or complex back and forth linking. Of course, I want the freedom to be able to edit the text to suit the new requirement, and to be able to specify whether the changes override or branch the original. The essence is that I’d like to be able to treat my writing ‘snippets’, my images, my maps etc as individual assets, and be able to re-work and combine these in many different ways without losing the source information. The closest analogy I can think of is the content management systems used by news and magazine publishers, where journalist and writers submit copy, photographers and artists upload their images, and these are combined into various formats (newspaper, magazine, webzine etc) by layout specialists and graphics designers. This entry was posted in Columns, RPG Tech Talk, RPG Technology, Self-publishing. Bookmark the permalink. The problem you described is exactly what I, too, find OneNote lacks, though it still is my prefered tool to this day . I might have an interesting link for you however. There is in fact an interesting kickstarter (disclaimer: I am backing it) going on right now. It from the company that also made Hero Labs and the new tool is called Realm Works. It appears to capable of everything you described, so I thought it might be of interest. I have actually been watching RealmWorks for a while, wondering when it would move from Beta into reality. I agree it looks like it might be a great tool.